HICKIES, Inc. Review by Crystal Porter | HICKIES - Never Tie Laces Are A Hit!! I have a 12-year-old with Aspergers and he has the hardest time with shoe tying. Even if it is cold outside, he would rather just put on his flip flops and let his toes freeze... Just so he doesn't have to try to tie his shoes or ask for help. I am so excited about Hickies because they have so many awesome colors to choose from and they are super easy to put on his shoes. 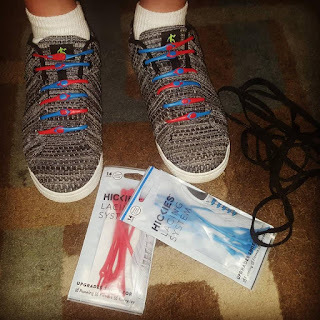 I was able to pick 2 packs of Hickies for my review and my son wanted 2 different colors for his shoes. I wanted to put them on his shoes the tight way, but he couldn't even get his foot into the shoe with it like that. So, we did it loose and he had no trouble putting his shoe on and he didn't even need my help! That is a PLUS! Now, he will wear shoes instead of flip flops on cold days! I would gladly buy more of these for him in the future and for me too. Each pack of Hickies comes with instructions on how to put them on the shoes, but if you have a hard time understanding you can always watch videos on Youtube. There are also other ways to put them on the shoes that aren't listed in the little instruction paper. Never tie, never worry. @Hickies Never Tie Laces on hickies.com 20% off w/ code USFAM http://usfamilyguide.com/coupon.php?bid=13107&dealid=3026. Disclaimer: This is a sponsored post for Hickies and US Family Guide. I received FREE product in exchange for my review. All opinions are 100% my own.